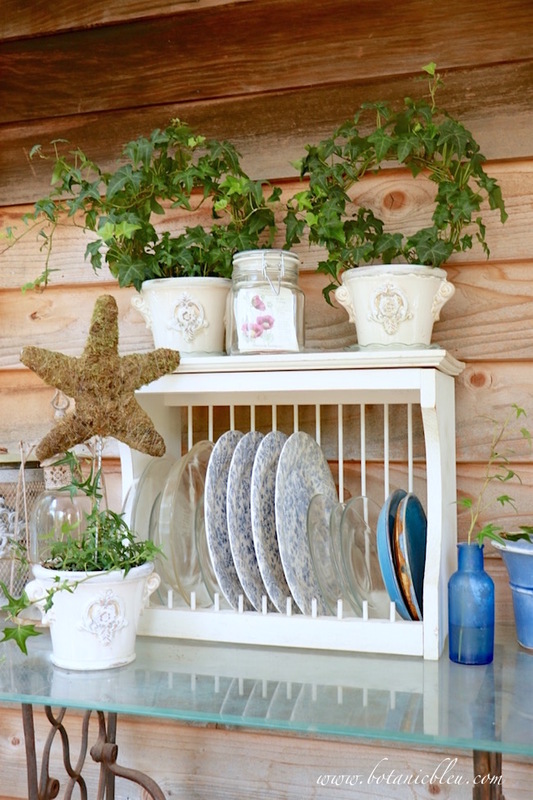 Plate racks have been popular features in country kitchens for generations. Prior to the modern kitchen design (in the United States) in the mid-20th century, kitchens had little storage, mostly in the form of open shelves and open plate racks. Shelves and plate racks fit in small spaces and made plates easy to reach when needed. Currently there is an upsurge of returning to open shelves and plate racks in American kitchens. 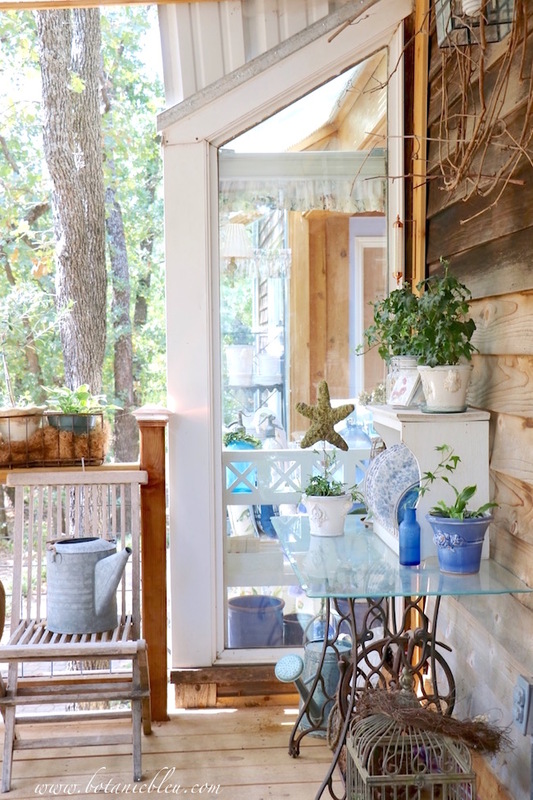 Magazines, blogs, and Pinterest boards showcase beautiful new kitchens, from tiny houses to luxury designs, with open shelves and plate racks. 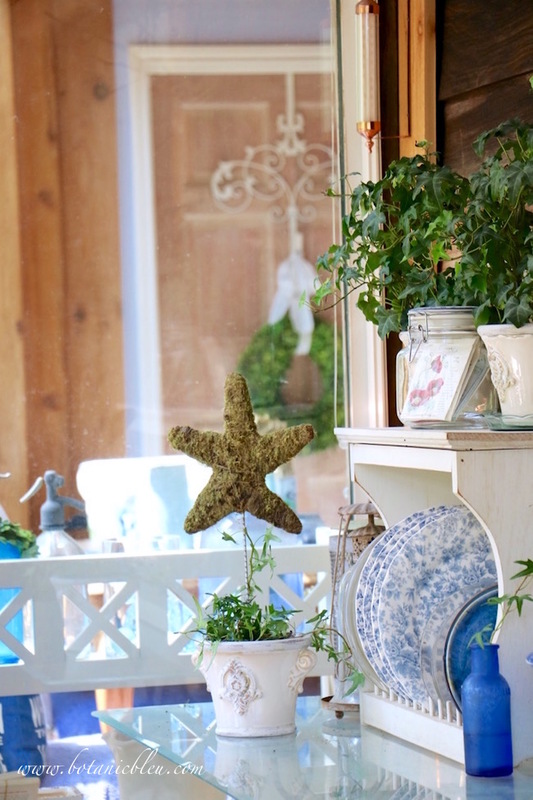 Do-it-yourself bloggers, house flippers, and fixer-uppers offer directions for installing shelves and custom-designed plate racks, including one floor-to-ceiling design with a hand painted recipe on the wall behind the plate rack. Internet links at the end take you to some of my favorites. If you love dreaming of a new kitchen or updating your old one, you are sure to find some inspiration. I fell under the spell of plate racks long before their current popularity. Antique dark stained wooden plate racks, usually located in dining rooms, were what caught my eye in Southern Living, Victoria, House Beautiful, Country Living, British Country Living... Had I found one, I am fairly certain I would have had an antique plate rack in our last house. Then we built our post and beam house filled with lots of windows and light-colored pine posts and beams. A dark stained antique plate rack did not fit the new house's style. Without looking for one, I found a new small white plate rack in a furniture store in the mall. A simple rack with a slightly rustic design and finish meant the price was very reasonable. Does that happen to you? You find your best things when you least expect to find them. For years I tried to find a spot for that small simple white wood plate rack in my kitchen. The spot I bought it for, over the kitchen sink, was too far away for me to reach. I ended up using the rack as a bench/table on the floor to hold plants in the sunspace. The plate rack is now on the porch being used as a plate rack! Late in the spring, we replaced the flooring in the kitchen, sunspace, living room, dining area, entry, utility room, and guest half-bath. Everything had to be moved to someplace else during the renovation and was stacked all over the house. The little white plate rack was buried beneath boxes and boxes of dishes from the china cabinet. Little by little this summer, the boxes of dishes have been unpacked, and displaced furniture has been rearranged in the house. Over the years, I've saved chipped and cracked plates and bought clear pie plates and salad plates from garage sales to use under flower pots. I stored them on the floor underneath a white bookcase in the sunspace. 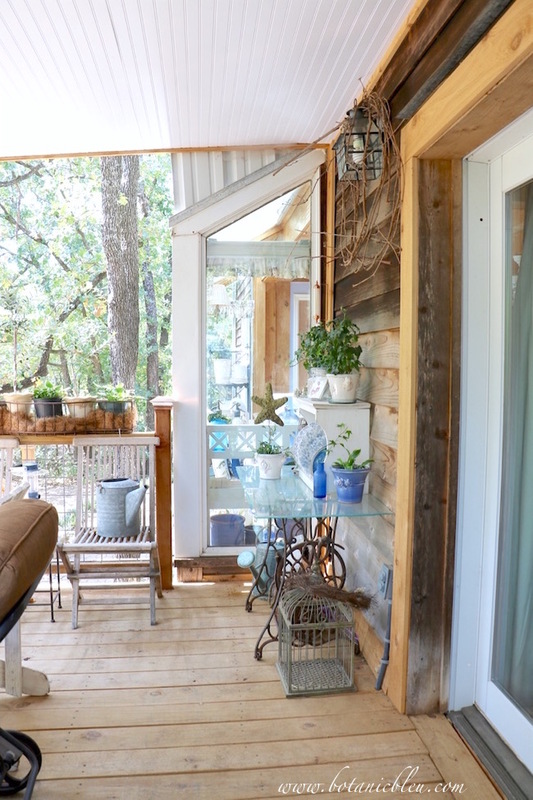 While moving everything back into place after the floor was finished, I realized the flower-pot plates could be stored in the wood plate rack on the new covered porch. Before, the open deck offered no protection from rain, snow, and sun, but now the deck has a cover to protect the small wood plate rack. Details about the new covered porch are at New Treehouse Deck Finished. Plants still sit on top of the plate rack. Plus there is room for more plants on the table on either side the small plate rack. 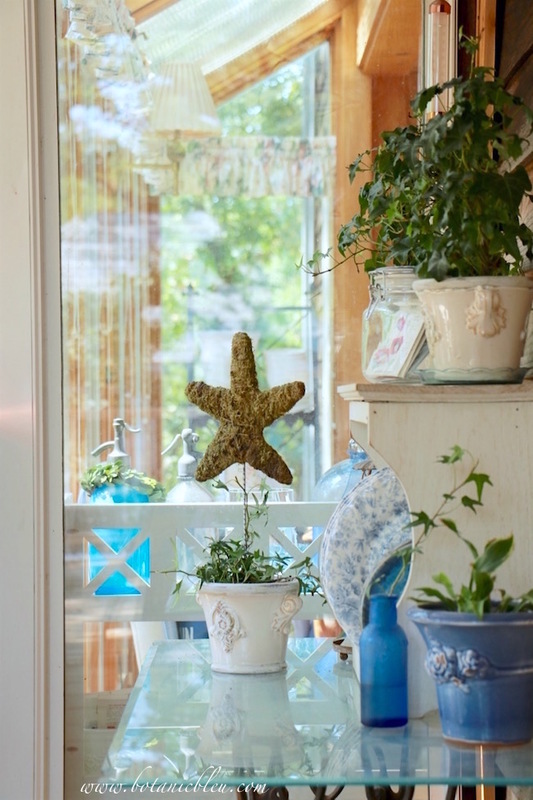 The repurposed blue and white dishes blend in with the blue and white dishes, bottles, and flower pots inside the kitchen sunspace. While the plate rack functions very well sitting on the table top, there is room to hang it on the wall above the table. I have a plan for installing hooks on the wall that will allow the plate rack to be hung either centered above the table or to be hung off-center above the table. An off-center position will give space on one end of the table for tall objects, like a small Christmas tree. 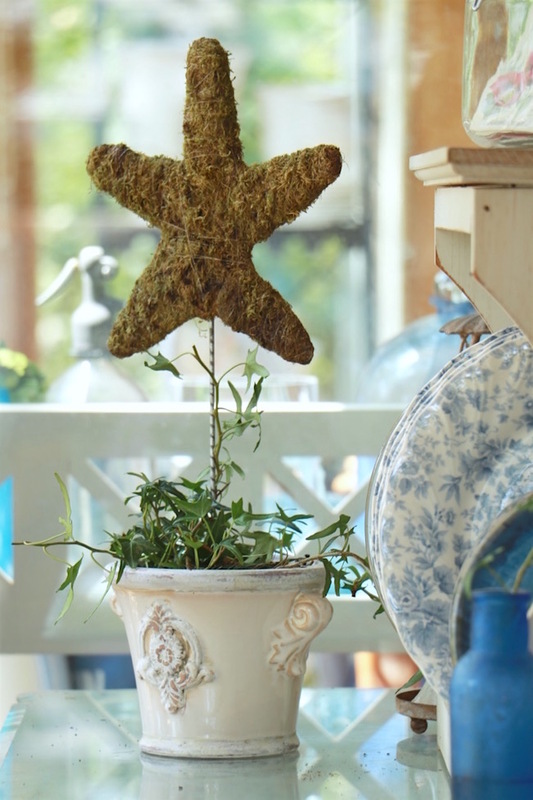 An upcoming post gives step-by-step directions for how to refresh a moss topiary like this star topiary. 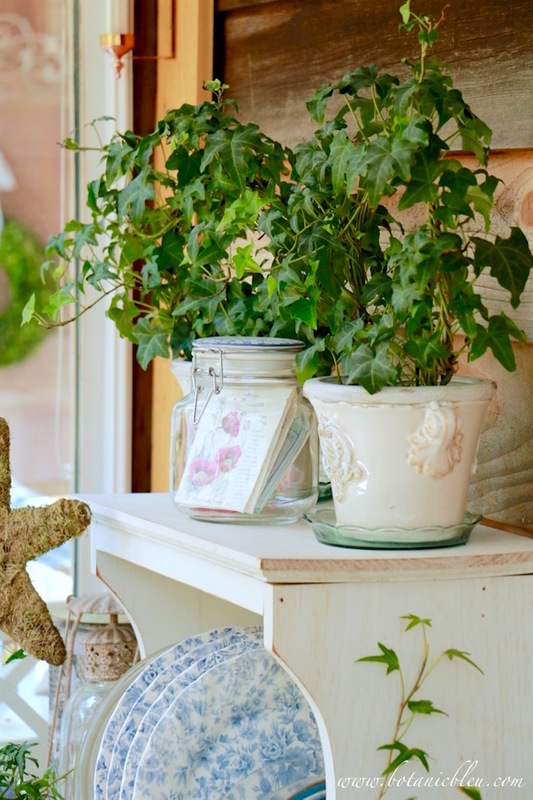 If you are like me and sometimes lose the battle in keeping ivy topiaries alive, you will want to see how to revive the moss base to use with a new ivy plant. 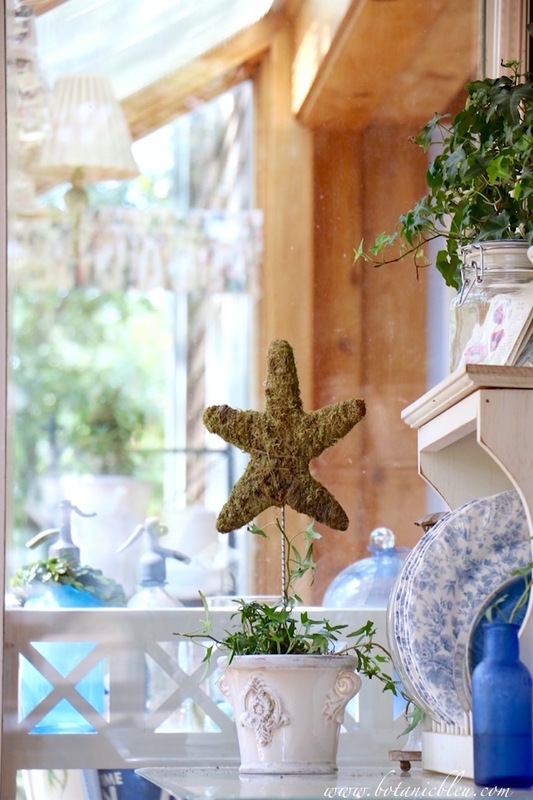 You may enjoy seeing the following for plate rack inspiration. Thank you for reading Botanic Bleu. A special thank you to readers who have checked on me. Recently I spent time with my extended family out of state, and I was without reliable internet service for several days. Please check back for special upcoming posts that include a fall home tour with several blogger friends and for updates on more outdoor home improvement projects. 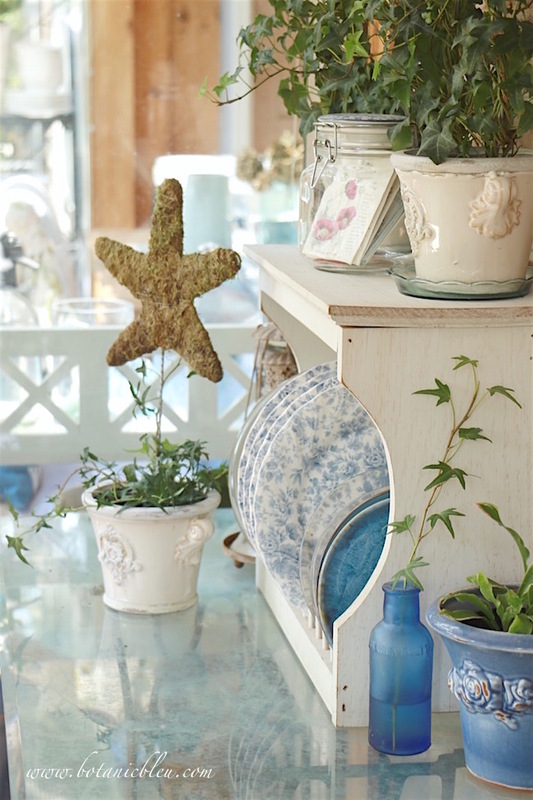 You truly have the gift of creating the most beautiful vignettes! And how on earth do you so successfully grow those ivy topiaries? I've ever been able to but I love them so. 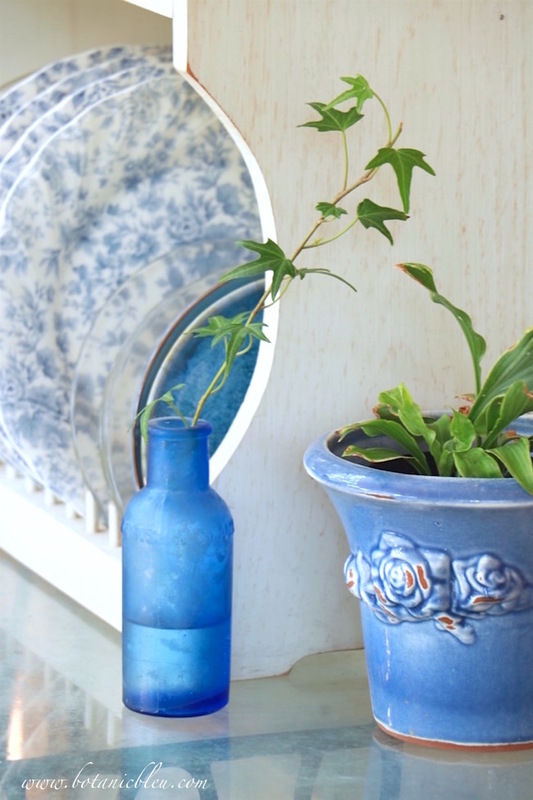 Your blue and white dishes mixed with the ivy topiaries is really beautiful. 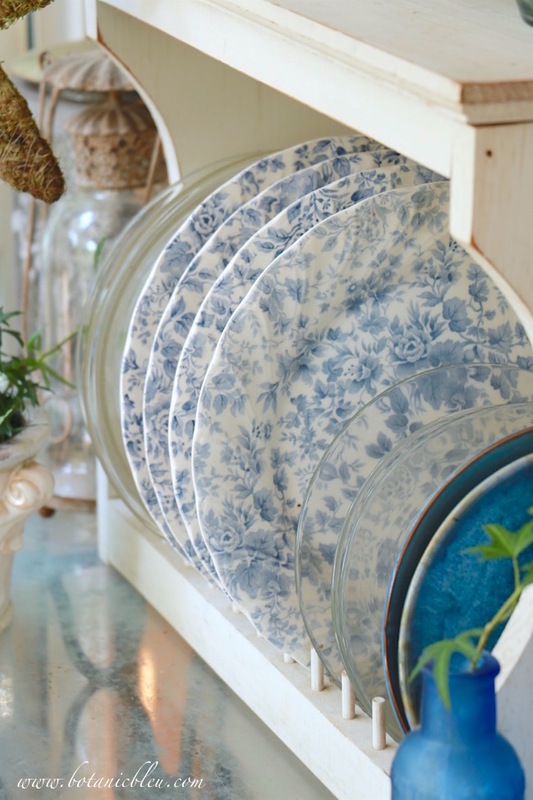 Love your plate rack and the idea of using clear glass plates for protection. Those blue and white plates are just beautiful on your rack. What a wonderful way to use it. Your photos are magazine worthy! Ooh, I love your plate rack...and the plates! I think I need a plate rack!